Port of Bellingham candidate Gary Jensen finally got around to filing his campaign contributions (late). In reviewing those Public Disclosure Commission C3 reports, I can see why he waited. $250 on 10/6/15 from Lynden Market Square. Craig Cole is a principal owner. The listed address is the same as Cole’s Straight Talk Consulting. $250 on 10/6/15 from Brown & Cole. Craig Cole is the owner. The listed address is the same as Cole’s Straight Talk Consulting. $250 on 10/6/15 from Susan Cole (I believe this is Craig’s wife). The address listed on the PDC report for Susan Cole is an address associated with Craig Cole’s Straight Talk Consulting. 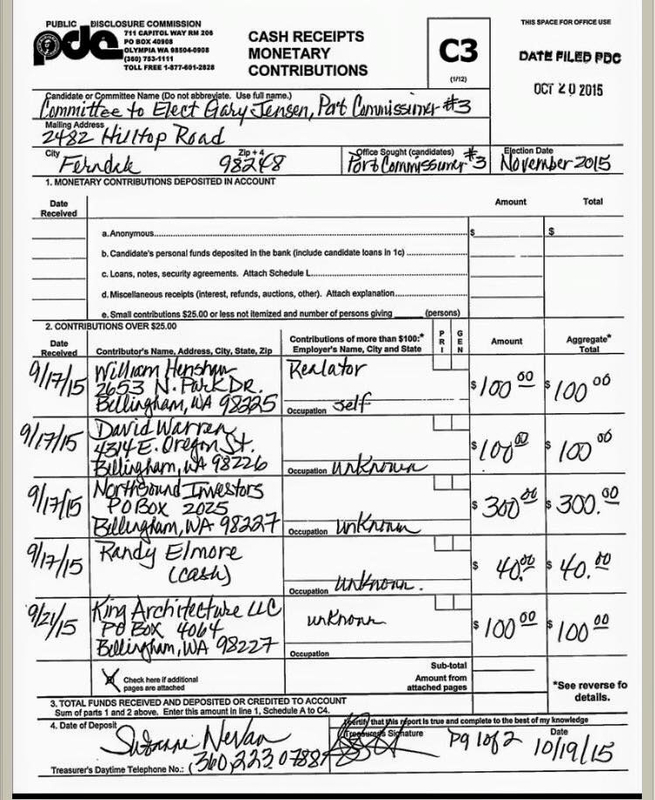 $600 on 9/28/15 from Whatcom County Republican Party PAC. 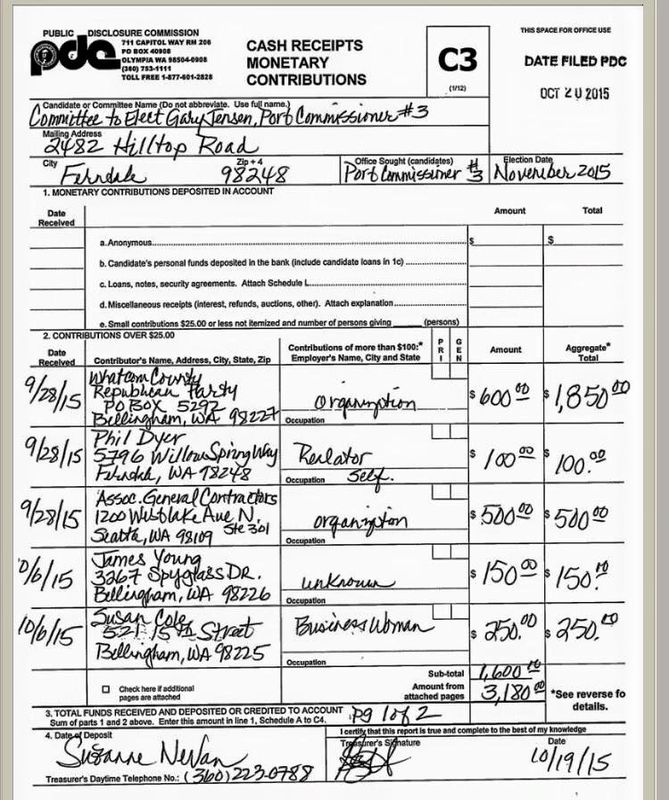 So far, Whatcom Republican PAC has contributed $1,850 to Gary Jensen’s Port campaign. GPT applicant Pacific International Terminal/SSA Marine has, so far, contributed approx. 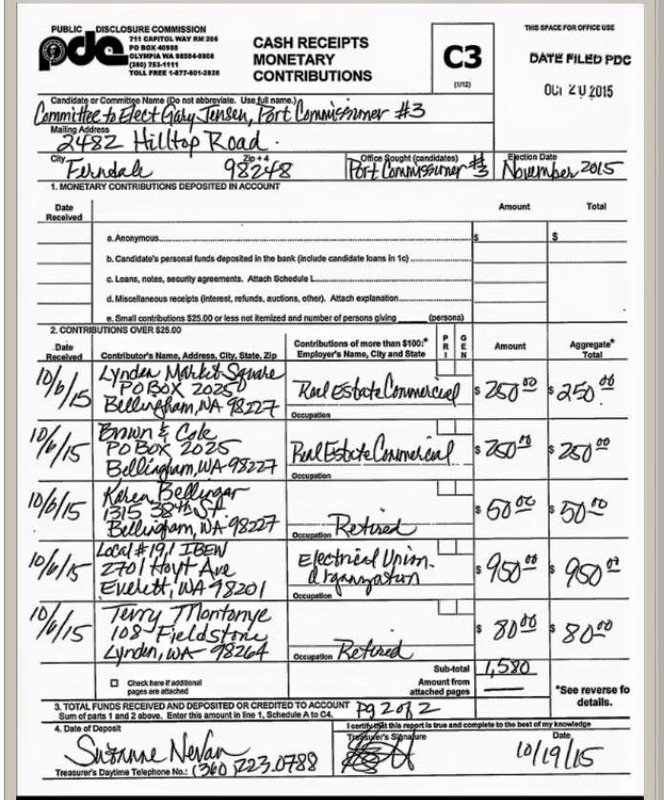 $45,000 to the Whatcom Republican PAC in this 2015 election. $100 on 9/17/15 from David Warren . He is former Chair of the GPT advocacy group (marketing mechanism for GPT project) Northwest Jobs Alliance. GPT consultant Craig Cole is the Director of Northwest Jobs Alliance. Warren is the former President of NW Washington Central Labor Council. Warren signed the Sept. 10, 2010 NWW Central Labor Council support resolution for SSA Marine’s GPT project. Fun fact: Sept.10, 2010 is about 6 months prior to the announcement of the GPT project and the GPT application submittal to the County. $950 on 9/8/15 from Nicholas Kaiser. He is Chairman and founder of Saturna Capital. 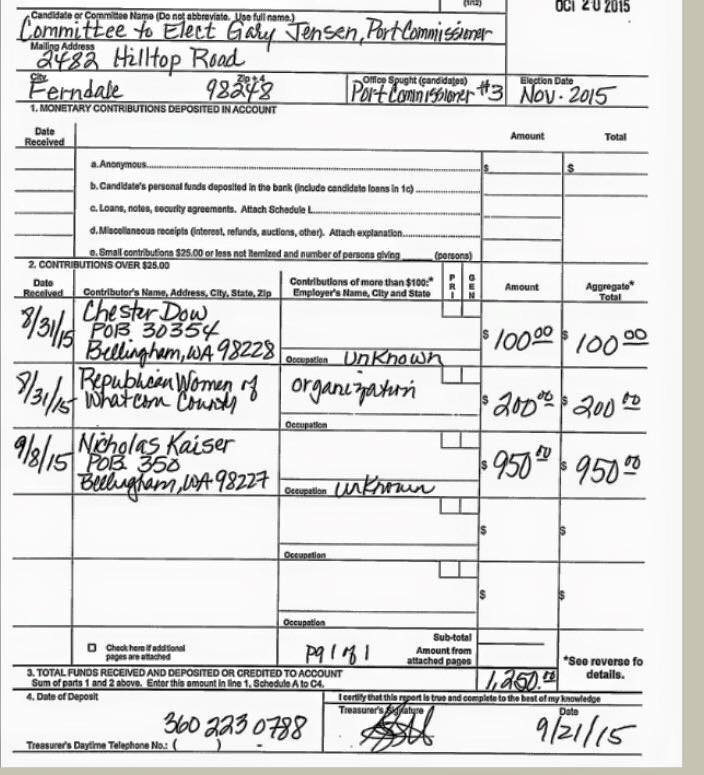 Kaiser donated $10,000 to the Whatcom County Republican Party on 2/18/15. $100 on 7/29/15 – Steve Moore. Moore was listed as Campaign Manager on the August 13, 2013 PAC registration form for the coal terminal interest-funded SAVEWhatcom PAC. $950 on 10/6/15 from IBEW local 191 – The website for IBEW local 191 has a dedicated page to the Northwest Jobs Alliance which at one time used to be under the name “Gateway Pacific Terminal,” and features promotional pieces about the GPT project. *Keep Washington Competitive (KWC) is designed to target the scope of the EISs for the proposed GPT and MBTL (Longview) coal terminals, and target environmental regulations. It has sponsored pro-GPT events such as the June 22, 2015 event at Fox Hall in Bellingham, hosted by Whatcom Business Alliance. KWC recently paid for the Wyoming and Montana delegation of current and former politicians to come to Washington state (Oct. 19 and 20), and tour the Millennium Bulk Coal Terminal in Longview, advocating for that project. This entry was posted in Commentary, Facebook Post, Information and tagged Bellingham, Campaign Contributions, Chet Dow, Coal, Craig Cole, Gary Jensen, IBEW 191, Keep Washington Competitive, Millenium Bulk Terminal, Nicholas Kaiser, North Sound Investors LLC, Northwest Jobs Alliance, November 2015 Election, Pacific International Terminals, Politics, Port of Bellingham, Public Disclosure Commission, Saturna Capital, SAVEWhatcom PAC, SSA Marine, Steve Moore, Straight Talk Consulting, Whatcom Business Alliance, Whatcom County, Whatcom Republican Party PAC. Bookmark the permalink.